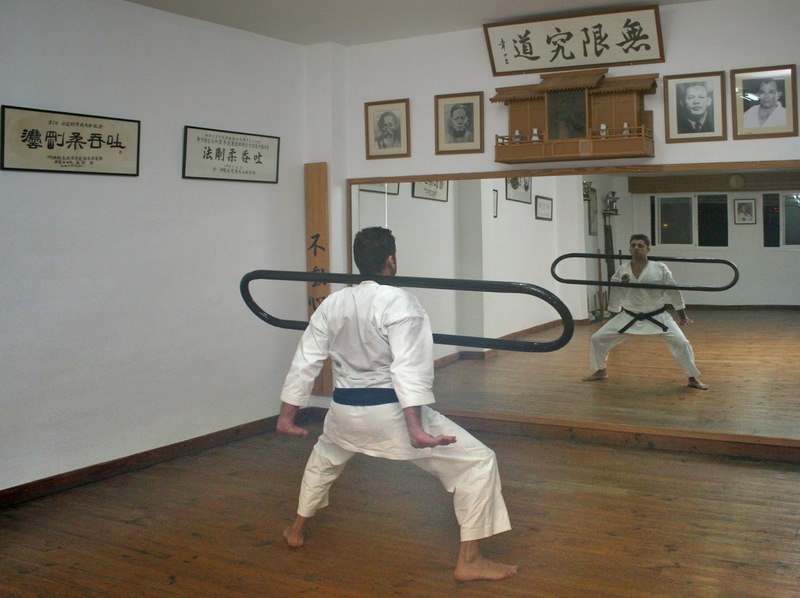 Traditional Shorin-Ryu Karate and Kobudo has origins in Okinawa. Shorin-Ryu translates as Shaolin Style indicating it originally was developed at the Shorin-ji Shaolin Temple in China where it was created by combining combat techniques with Zen. 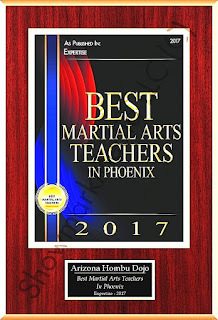 Today, Shorin-Ryu Karate remains one of the primary karate arts taught on Okinawa, and now in Arizona. There are differences between traditional Okinawa karate, traditional Japanese karate and Korean taekwondo: so many differences that one could write a book about them. To the uninitiated, these are subtle and overlooked until a person has years of experience in martial arts. Japanese sensei focus on sport; thus kata in Japanese dojo must be done with exact and precise stances. Punches and kicks must be exact: there is no possibility of variation in movement in any kata. In Japanese schools, students are constantly stopped, held in position at certain points of kata while the sensei walks from student to student making minor adjustments. The 'ma' known as timing and distancing, are important with focus on winning sparring contests & performing kata in front of an audience. 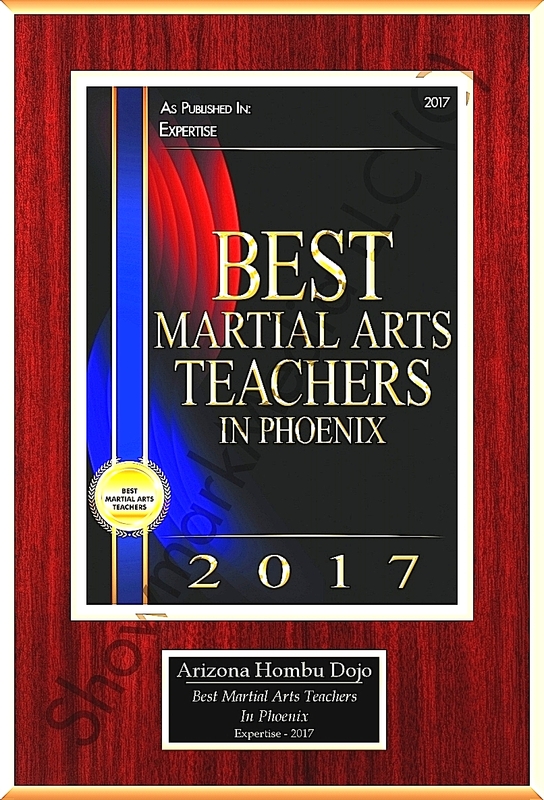 top karate instructors in Phoenix. The focus in most traditional karate schools is on 'imi' or the meaning of kata - something that is ignored by most Japanese sensei. The meaning of kata is very important in Okinawa karate rather than execution of kata. In Okinawan karate, the student is taught what each move in every kata is used for, and each kata is broken down into self-defense applications that are practiced to insure the student can defend themselves. There is no concern for winning: contests are not part of most traditional Okinawan karate schools, and students are taught to develop as much power and focus as possible for self-defense and karate taught as a dangerous weapon. Keep in mind that karate is a unique martial art that evolved on Okinawa over hundreds of years, and Okinawa is part of an island chain that lies between China and Japan. Karate, an indigenous Okinawan art, was not introduced to Japan until 1917 and not accepted until 1922. It was introduced to Hawaii in the 1930s and later to the US (Phoenix, Arizona) in 1946. Prior to its introduction to Japan, karate was not practiced as sport. It was not until the 1960s that people in the US began to recognize karate as different from judo. When karate was introduced to Japan by Gichin Funakoshi in 1917, it was touch and go as to whether or not it would be accepted by the Japanese. The Japanese thought of Okinawan people as country bumpkins - in other words - peasants with little social grace. Gichin Funakoshi had to modify karate, rename each kata to give them Japanese names; and, most importantly, establish a positive working relationship with Japanese judo founder, Dr. Jigoro Kano, before the Japanese would accept karate. The Japanese were so nationalistic that individuals like Mas Oyama had to change their names to receive recognition. Oyama was Korean by birth, and created a Japanese style of karate known as kyokushin in 1957. This type of backwards thinking by the Japanese still pervades, and is one of the primary reasons Japanese karate took a different path than Okinawan karate. In 2015, our nephew worked on Hawaii transporting patients from their homes to various medical facilities, when he picked up one, old, Japanese man (Hawaii has a large community of Japanese). While driving to a medical facility through a neighborhood known for high crime, Jeremy attempted to strike up a conversation without realizing there was such a strong nationalism with many Japanese people. Jeremy said, “Hey, you look like my Okinawan friend …”. The Japanese man responded, “What a terrible thing to say that I look like an Okinawan,” and demanded Jeremy stop the vehicle so he could get out and walk! Most are unaware that there is a difference between Okinawa and Japanese karate, but there is a significant difference in how kata is practiced and perceived and the philosophical purpose of karate. In a Japanese dojo, kata must be exact with no room for variance in stances, there are distinct breaks in timing known as ma, and slow techniques are mixed with fast. In Japanese dojo, students are constantly held in stances during both kihon (basics) and kata practice while the sensei walks around from student to student making minor adjustments to the position of feet, shoulders, knees, wrists, weight distribution, etc. There is also considerable emphasis on deep stances. I still remember one evening as a teenager. 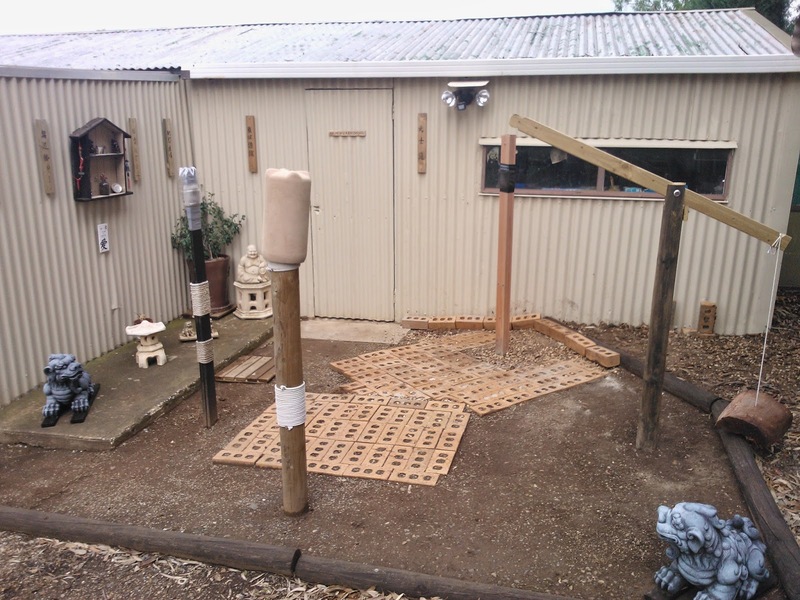 On this evening, our class squatted, duck-walked around the dojo, did dozens of squat-kicks, squatted in kiba dachi (horse riding stance) with a partner standing on our thighs while placing their hands on our shoulders to add weight to our squats. 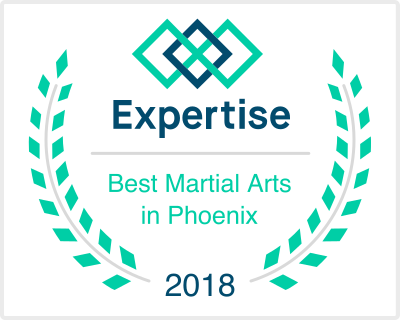 We did a few hundred kicks - it was a tremendously hard workout for a young teenager with no previous experience in formal exercise prior to joining the Black Eagle Federation Karate dojo. Eight years later, I found basic training in the US Army to be a breeze after karate training. When the class ended, I had to walk home through Fairmont Park (in 1964, the park was an unfriendly place populated by older teens called greasers who looked-forward to harassing younger teens). The distance to my home was 1.5 miles: not much of a distance today, but for a 14-year-old, it was a challenge. I had no strength left in my legs and had to walk stiff-legged all the way. Periodically I relaxed a knee and collapsed. When this happened, I crawled to a tree, telephone pole, park bench, etc, to pull myself up. I don’t remember being harassed while walking through the park on this night, probably because the greasers felt pity on a handicapped teen. At the time, I was training in kyokushin Japanese karate. Much emphasis was placed on kiba dachi as a fighting stance and zenkutsu dachi (front stance). These were found throughout our kata. When I later trained in Wado-Ryu karate (Japanese) at the University of Utah, we focused considerably on neko-ashi dachi (cat stance). In Shotokan karate (Japanese variety of Shorin-Ryu), the emphasis was on front and back stances (kokutsu dachi) with great emphasis on deep and perfect stances. In Kempo Karate (Japanese) the emphasis was again on kiba dachi. Kata were performed like a military drill team in Japanese dojo and designed for tournaments. All Japanese systems taught kata with no explanation of application. Thus, controversy developed as to the use and purpose of kata. Sometimes, in a Japanese dojo, we practiced kata with one person performing kata surrounded by three to four attackers along embussen lines. The attackers were required to kick or punch as we moved from one technique to the next. It didn’t seem realistic and applications were designed for competition sparring. Periodically our sensei in kyokushin karate taught general self-defense, but the applications were never linked to kata. Much time was spent on sparring due to the sport emphasis and general lack of understanding kata. It didn't take long, but we all became bored as we were not learning anything new. None of my Japanese sensei had much background in self-defense and none had background in kobudo. In the final analysis, the Japanese martial arts were military-like with little room for interpretation. They were in conflict to philosophies of well-known Okinawan practitioners. Gichin Funakoshi, the father of modern karate, stated, “The purpose of Karate lies not in victory of defeat, but in the perfection of its participants”. Okinawan karate was all about improving the practitioner, not winning competitions. In the Shorin-Ryu karate schools, kata were taught for muscle memory, balance, power and self-defense. Bunkai (pragmatic self-defense) was the focus of kata and used to practice defending all sorts of attacks and taught to develop power, focus and body hardening. This is the reason why those who study Japanese karate constantly ponder at the purpose of kata, but those who study traditional Okinawa karate continually practice kata along with self-defense and understand the importance of kata. In Japanese karate, kata has little purpose other than to please an audience. In Okinawa karate, kata and karate are the same, as stated by the late Grandmaster Shoshin Nagame. Each kata is broken down into a group of self-defense applications that are practiced individually to insure the student can defend themselves. Individual applications can be referred to as mini-kata, sometimes referred to as Shinken Shobu no Kata also Kime no Kata. In Okinawa karate, students learn relatively deep stances to build muscle strength, but as the student gains expertise, higher and more natural stances replace deeper stances. The Okinawan karate stances are meant to be practical for self-defense by being natural and quick. Whereas the very deep Japanese stances are designed for competition. In the past, Okinawa martial artists did not trust Japanese and would not teach the Japanese bunkai. Kime is very important in traditional karate - Kime is about power and focus in both strikes and blocks. Every block should be as powerful as every strike. I remember attending clinics in the past where another sensei sent his students to train with me so they could experience blocking power. These power blocks were taught in kyokushin kai karate and I still use them today. In addition to kime, all strikes and blocks need chinkuchi! Chinkuchi is an Okinawa term that applies to explosive full-body power. If you ever have a chance to watch Tadashi Yamashita, you will see a visual explanation of this explosive power. Chinkuchi is similar to kime, which is a focused strike, but includes the entire body in striking and blocking - hip rotation, focused punch or block, last-second tensing of all muscles and joints followed by a quick relaxation of the muscles. Japanese karate schools kick low, medium and high (similar to taekwondo). High kicks are good in competition; however, Okinawan kicks are designed for knees, kidneys, stomach, groin, ribs, shins, ankles - in other words - below the neck and mostly below the belt. In addition, the Okinawan kicks employ kekomi geri (thrust kicks) as well as toe kicks. To develop a toe kick, one must train the big toe to build toe strength. There are stories about Goju-Ryu’s Chojun Miyagi who periodically demonstrated his powerful tsumasaki geri by penetrating gas cans with his big toe! One of our martial art students, Dr. Bergkamp, traveled to Okinawa a few years ago to tour dojo and returned to Arizona with a very impressive bruise on his stomach outlining a big Okinawan toe with a couple of smaller toes. One must wonder how practical such kicks are in our culture. Unless you are a beach bum, it is unlikely you would ever use such a kick. So in our dojo in Arizona we will introduce this kick to our students, but it is not a main focus. Kobudo is a another example of differences between Japanese and Okinawan dojo. In all of the Japanese dojo I trained in, no weapons were introduced or practiced. This part of karate is ignored by most Japanese karate schools. However, kobudo is a major part of Okinawa karate. It has been said that “Karate and Kobudo can be likened to the tires of a bicycle. Both are needed to make the bike move”. 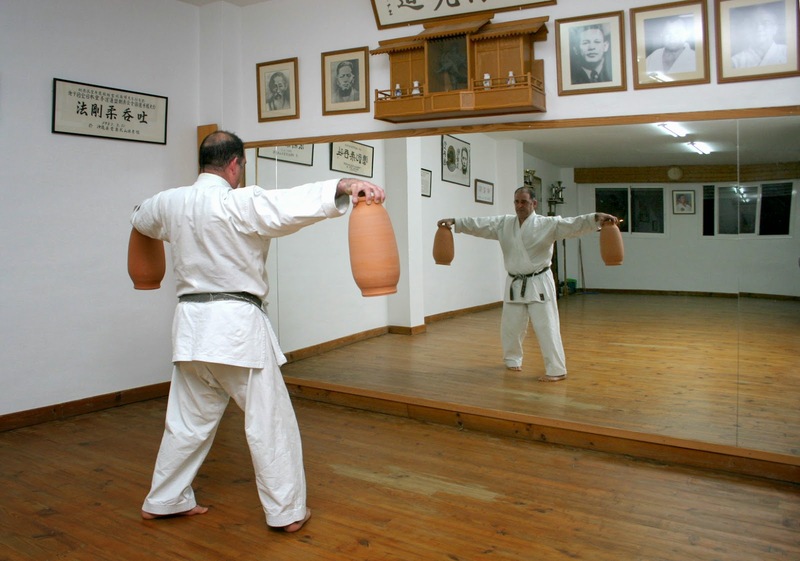 In many Okinawa dojo, tools are available to build strength, endurance and callous. They are designed for the whole body, and include tools for strengthening wrists, fingers, toes and knuckles. 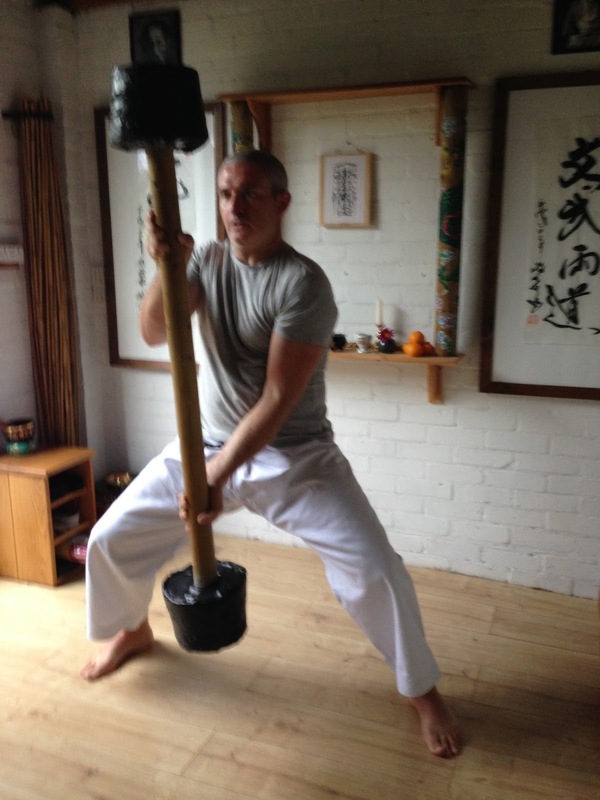 In a book by Michael Clarke entitled The Art of Hojo Undo, many exercises are described with descriptions of traditional Okinawan strength training tools and how they are made. Hojo undo translates as supplementary exercises. For those who are serious traditional practitioners, these tools are a must, although there are many modern equivalents that can be used. 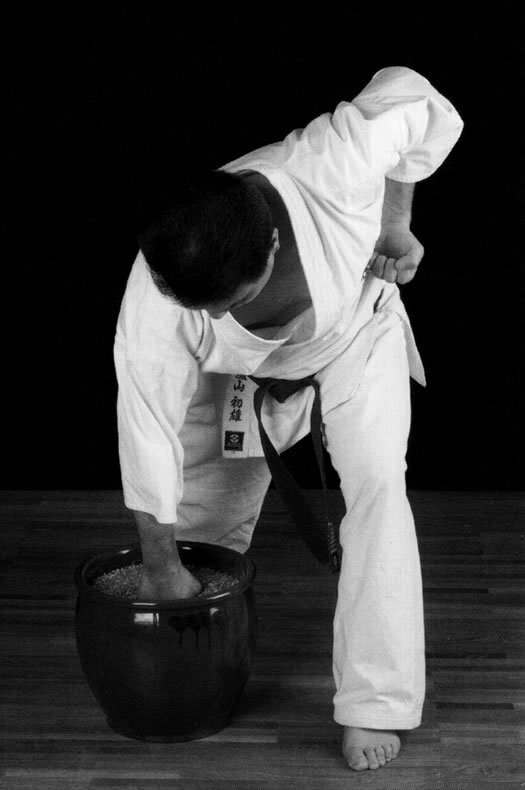 Some tools used in hojo undo include: makiwara, chi-ishi (strength stones), nigiri game (sand-filled ceramic jars), ishisashi (stone lock), tan (bar bell), kongoken (sand-filled ring), tou (bamboo bundle), kakite bikei (blocking post), makiagi (wrist roller), ude kitae (blocking posts), and jari bako (sand jars). Another difference between Okinawan and Japanese karate is the practice of toide in Okinawan schools. 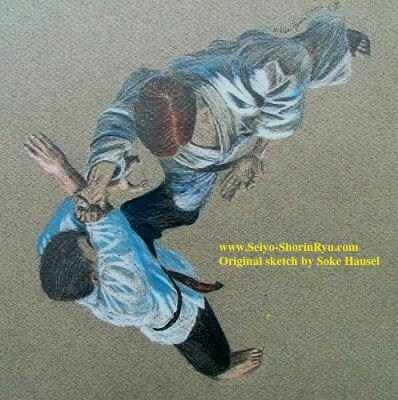 Toide is an Okinawan art that includes joint locks, throws, grappling, etc, similar to traditional jujutsu. Many toide techniques are hidden in Okinawan karate kata and practice in bunkai. Japanese karate is tailored for large groups; whereas Okinawan karate is designed for small groups. This is one reason many Okinawan commercial dojo fail outside of Okinawa as they are not conducive to large groups needed to finance a karate school. Such dojo rely on the generosity of their students and do not set high fees, and many are supported by donations - this is a problem as donations never come from Western students who do not see the value that Okinawan students see. However, when Okinawan schools are attached to and supported by a university, they often draw large groups because of educational value. In Japanese dojo, the atmosphere is martial and there is often intimidation by senior students. However, Okinawan dojo are more family friendly and members are encouraged to become friends. Although, most think of karate as Japanese, this is misleading. Karate originated on Okinawa when the island chain was an independent nation separate from Japan with strong ties to China. It only became Japanese because samurai conquered Okinawa in the 17th century. Karate was kept secret from the Japanese people until 1922, and Okinawa remained a separate nation until 1879. Many karate techniques, traditions, forms & weapons were indigenous to Okinawa or borrowed from China or other southeast Asian nations. The Japanese had little influence on karate until it branched from a combat discipline to competitive art. Still, the original Okinawa karate, such as Shorin-Ryu remain mostly sport-free. The Japanese hybrid (sport) karate has taken a separate path, even though both have similarities. 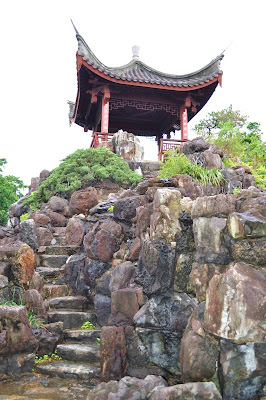 Legend states a Buddhist monk named Bodhidharma traveled from India to northern Henan province of China where he taught Zen at the Shaolin Temple around 525 AD. When Bodhidharma arrived at Shaolin-si (small forest temple), he began lectures but found most monks unfit & lazy. If you examine the kanji in our copyrighted icon on the above left side of the title at the top of this page, the 3rd and 4th kanji from the top refer to the 'small forest temple' or 'Shaolin Si' to indicate Shorin-Ryu has roots at the Shaolin Temple. Bodhidharma realized the solution was to improve physical conditioning of the monks in order to improve their minds; thus, he began teaching physical exercises with meditation known as 'Shi Po Lohan Sho' (18 hands of Lohan) reputed to be a fighting system. The blending of Lohan with Zen evolved into the first martial art. To be a martial 'art' there must be intrinsic value for the spirit, body and soul. One of the earliest known forms of martial fighting was Kalarippayattu. This ancient art from southern India may be similar to Shi Po Lohan Sho. There is no way of dating the art, but it is a fascinating concept and the art shows circular open hand strikes, blocks and kicks with acrobatic maneuvers similar to Kung Fu. Bodhidharma's teachings became the basis for Chinese martial art which was later introduced to Okinawa, including Hakutsuru (white crane) of the Shaolin Temple in southeastern China. White Crane was developed by a woman who mimicked crane movements. In its earliest stages, karate was an indigenous form of fighting developed in Okinawa called Te, or 'hand'. Weapons bans imposed on Okinawa encouraged refinement of Te techniques & development of kobudo (peasant weapons). Karate developed in three villages: Shuri, Naha & Tomari. Each was a center for a different sect of society: kings and nobles, merchants, farmers and fishermen, respectively. For this reason, different styles of Te developed in each village and became known as Shuri-te, Naha-te and Tomari-te. Collectively these were called Okinawa-Te, Tode (Chinese hand) or Kara-te. The Chinese character used to write Tode could be pronounced 'kara' thus the name Te was replaced with kara te or 'Chinese hand art'. This was later changed to karate-do to adopt an alternate meaning for the Chinese character for kara, meaning 'empty'. Thus, the karate came to mean 'empty hand'. The 'do' in karate-do implies 'way' or 'path' emphasizing moral and spiritual philosophy. Shorin-Ryu Karate evolved from Okinawa-Te as a combination of a native Okinawa fighting arts and Chinese martial arts. It is known as a hard style or 'external' martial art. One notable martial artist was Anko Itosu often referred to as the Grandfather of modern karate. Some of his students were instrumental in the popularization of karate on Okinawa and its introduction to mainland Japan. His students carried on his teachings using the name of Shorin-Ryu. Since Itosu's passing (1915), Shorin-Ryu branched into variations. Branches of Shorin-Ryu include Shobayashi Shorin-Ryu ('small forest style'), Koybayashi Shorin-Ryu ('young forest style'), Matsubayashi Shorin-Ryu ('pine forest style'), Matsumura Seito Shorin-Ryu ('orthodox' style), Sukunaihayashi (Seibukan), Ryukyu Hon Kenpo (Okinawan Kempo), Kodokai Shorin-ryu, Seidokan, Kobayashi Shorin-Ryu (Shidokan, Shorinkan, Kyudokan), Chubu Shorin-Ryu, Ryukyu Shorin-Ryu and Seiyo Shorin-Ryu. So, to say Shorin-Ryu Karate, is to almost the same as saying traditional Okinawan karate, as there are several varieties. Many know Gichin Funakoshi (1868-1957) as the Father of Modern Karate. Funakoshi was a master of Shorin-Ryu Karate, although his students renamed his Shorin-Ryu martial art as Shotokan to honor the great instructor. His teacher was Anko Itosu. When we search for information on Itosu (and other Okinawan martial artists) we are confronted with a variety of names for some individuals. This is because Okinawan names were complicated by social status: some maintained names for different occasions, while others changed names. 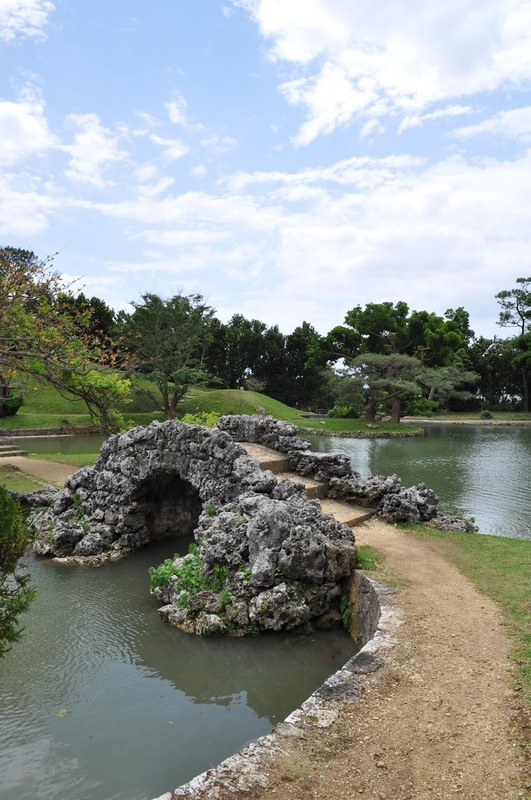 As a result, Okinawan martial artists often had more than one name. Itosu is credited with creating the five Pinan kata (referred to as Heian in Japanese) that were extracted and modified from the long and complex Kusanku kata (known as Kanku in Japanese). He is also thought to have taken a complex Naihanchi kata (Tekki in Japanese) and split it into the three (Naihanchi shodan, nidan and sandan). Some believe he also authored Kusanku Sho and Passai Sho katas. Itosu was born near Gibo station (26°13’28"N; 127°43’8”E - see Google Earth) in the village of Shuri, Okinawa in 1831. Shuri is now a district of Naha City, but was a separate village. Shuri village is where the art referred to as Shuri-te was developed and later renamed Shorin-Ryu karate in 1933 to honor its roots. The kanji that describe Shorin-Ryu translates as “Pine Forest Style” in Japanese, and translates as “Shaolin Style” in Chinese indicating ties to Kung Fu practiced by the Shaolin monks. Itosu’s first name was Anko (the kanji can be alternately read as Yasutsune, and his last name Shishu can be read as Itosu), but he is commonly known as Anko Itosu. Itosu was born to a prominent family on Okinawa and educated in Chinese literature. At approximately 5-feet-tall, Itosu was nearly average height for Okinawa and many described him as stocky, barrel-chested, and very strong with considerable discipline. As a child, Itosu was shy and introverted - karate gave him confidence like it has for so many of us. Itosu trained under the great karate practitioner Sokon ‘Bushi’ Matsumura who in turn was a student of Tode Sakagawa (1733-1815). Tode Sakagawa in turn studied under Kusanku (for whom the famous Kusanku-Dai kata derived its namesake). Itosu also trained under other martial artists including Sensei Nagahama. Nagahama was known to be very diligent and stressed strengthening the body. It is likely this influenced karate which is a method to develop physical and mental strength and as well as self-defense. Itosu began training under Matsumura of Shuri, later trained with Nagahama of Naha City, and upon Nagahama's death, became a disciple of Gusukuma of Tomari village. Thus, he trained in all three-principal styles of Okinawa Karate we refer to as Shuri-Te, Naha-Te and Tomari-Te. Because of his influence, Seiyo Kai (our style of Shorin-Ryu) has kata from each primary system of Okinawa karate. Another interesting aspect of Itosu was described in a book "Okinawan Karate: Teachers, Styles And Secret Techniques," by Mark Bishop. Bishop contrasted the karate of Azato, which had Matsumura heritage mixed with a swordsmanship perspective and Itosu's karate. "While Azato believed hands and feet should be like bladed weapons and one should avoid all contact of an opponent's strike, Itosu held the idea that the body did not have to be so mobile and should be able to take the hardest blows”. This is why our Shorin-Ryu includes the practice shitai kori or body hardening. Part of Itosu's karate training included makiwara. He once tied a leather sandal to a stone wall to build a makiwara. After several strikes, some stones fell from the wall. He relocated the sandal several times before completely destroying the wall. This is similar to Sensei Scofield’s father at the Arizona Hombu Dojo, who studied Shorin-Ryu as a US Marine on Okinawa. Patrick reported his father knocked down a cinder block wall with a back kick. In 1901 Itosu began teaching karate at the Shuri Jinjo Primary school and taught at the Dai Ichi middle school and the Okinawa prefectural Men's Normal School in 1905 (Bishop 1999). In 1905, Itosu was a part-time teacher of karate at Okinawa's First Junior Prefectural High School. It was there he developed the teaching methods that are still practiced today.